I own a Dell PowerEdge 1600SC with a LSI 1030ST controller and I can't see the attached disk with the latest Dapper kernel image revision, while wi th standard 6.06 version (2.6.15-23) I can mount the disk smoothly. I can say that even with more recent kernels (2.6.17 on latest knoppix, for example) I cannot see the disk, while with Ubuntu 2.6.15-23 (server or desktop flavour) as said, it works. Hi, we need "lspci -vvn" output to be able to debug this further. btw, your drives are attached to the megaraid controller, not the 1030. Kyle is looking into this and creating some test packages. Looks like some PCI ids got moved around to the wrong driver. This is a regression in a dapper security update and should be fixed for the Dapper point release. One-liner fix, doable for dapper.2. Bumping back to confirmed, since it didn't seem to have helped. Do you have linux-backports-modules installed as well? I suspect you'll need this installed by default. We may have to make sure upgrades work in this case for dapper.2 kernel. Vide, that's more like a workaround. Thank you for testing! So it seems that some modules are not shuffled between linux-image and linux-backports-modules properly. Upgrades must not break when l-b-m is not installed (which is the entire point of having a separate l-b-m). Update from the kernel team regarding this bug? Ben? Since this was caused by what was hoped to fix the problem (moving PCI id's), the regression appears to be worse than the fix. Reverting back to previous PCI id layout. As a side note, the updated megaraid driver in linux-backports-modules-2.6.15 will hopefully fix this problem, without the regression. However, current build of the package has another bug preventing megaraid from being loaded. Working on an updated package to test this from. Ben, doesn't this need a newer linux-source-2.6.15, too? I cannot find it at the URL you gave above. Also, do you have the source package somewhere? I need to build amd64 packages. I am working on a test environment to check this, will provide feedback as I get it. When I try the package it complains about dependency on the -686 image. I am trying to help a customer test this but they only have a-server image installed. Can you provide a -server package ? Fabian, there is linux-backports-modules-2.6.15-51-server, too. You should now get complete removal. Issuing this last command again will give an error about unexisting package confirming its complete removal. We tried the proposed fix and it didn't work. 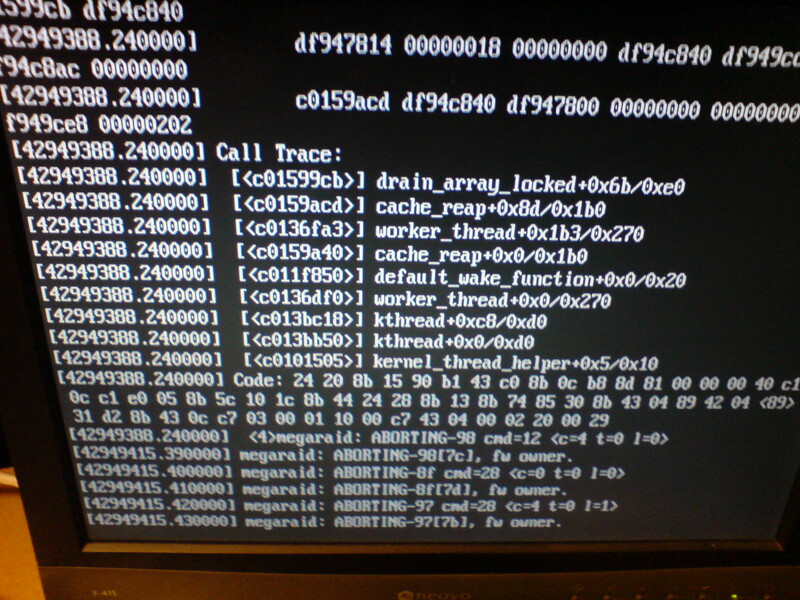 I am waiting for a copy of the output of initial booting sequence, although it didn't get very far. Marc also did the test on the LSI controller and ran into the same problem when RAID was actually enabled. Without RAID it works fine. why did you mark this as invalid?